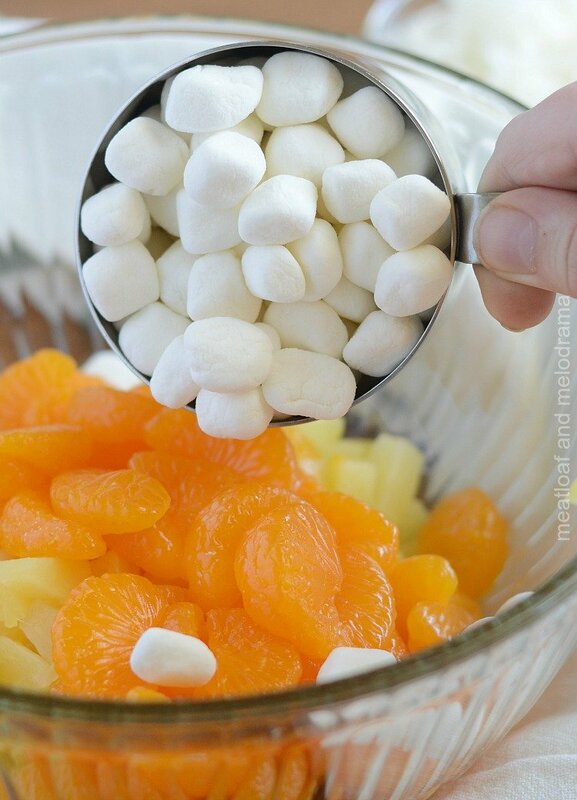 This Easy Ambrosia Fruit Salad recipe is made with sour cream, pineapple, mandarin oranges, marshmallows and coconut. 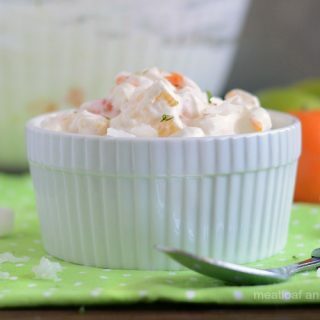 It’s a cool and creamy classic side salad that’s perfect for holiday dinners, potlucks and picnics! It’s that time of year again when you start to see fruit salad recipes popping up all over. But, that’s good, right? If you’re looking for an easy summer side dish, you’ll love this classic ambrosia fruit salad! I found this gem in my mom’s recipe collection. 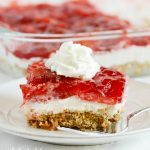 You all know my soft spot for retro recipes, and this one definitely jumped out at me! Since we’re heading into summer potluck season, it’s perfect timing. 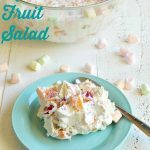 This ambrosia salad is your basic recipe for fruit salad with sour cream and marshmallows or a marshmallow salad with sour cream. You can also call it 5 cup salad, although this particular recipe doesn’t have exactly one cup of everything. 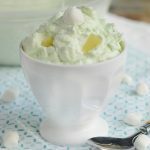 The Hubs grew up with an ambrosia recipe that called for whipping cream or Cool Whip, but this one only has sour cream. And it doesn’t have nuts, which is perfect since my kids hate salads with nuts! I think every family has their own version of ambrosia, and that’s totally fine. You really can’t go wrong with any of them! This recipe is so easy that I turned it over to the kiddos. They love helping out in the kitchen, and I have one less dish to make. Works for me! You just drain your pineapple tidbits and mandarin oranges, and then you add them to a mixing bowl. Actually, you can save the pineapple juice for another recipe if you plan ahead. We had Hawaiian pork chops the other night, and I saved the pineapple juice to use in the ambrosia. Cool, huh?! Then, you add some mini marshmallows and a little shredded coconut. One of my kids hates coconut, but she didn’t complain about it at all in this recipe! It really blends in well, so don’t skip it, even if you’re not a coconut lover. Try it first, and if you still don’t like it, you can leave it out next time — K? Stir it the sour cream, and that, my friends, is it. I added a little bit of lime zest to the top — just for a little color and a zip of flavor. This is totally optional, though. 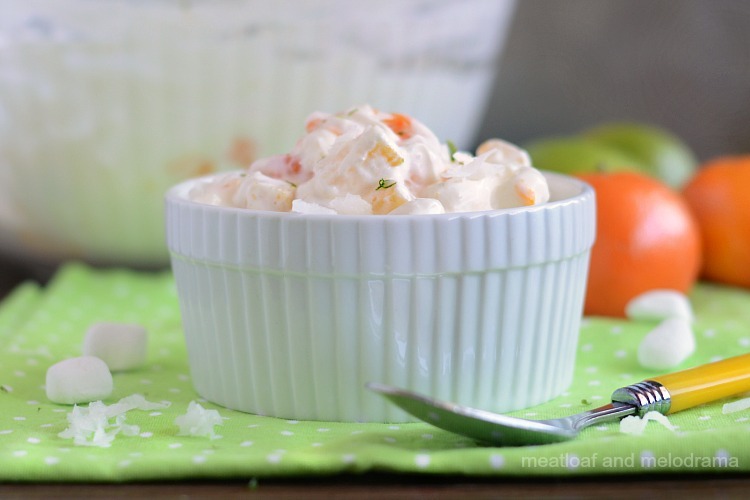 This ambrosia salad is cool, creamy and just sweet enough. No wonder it’s named after the food of the Greek gods! 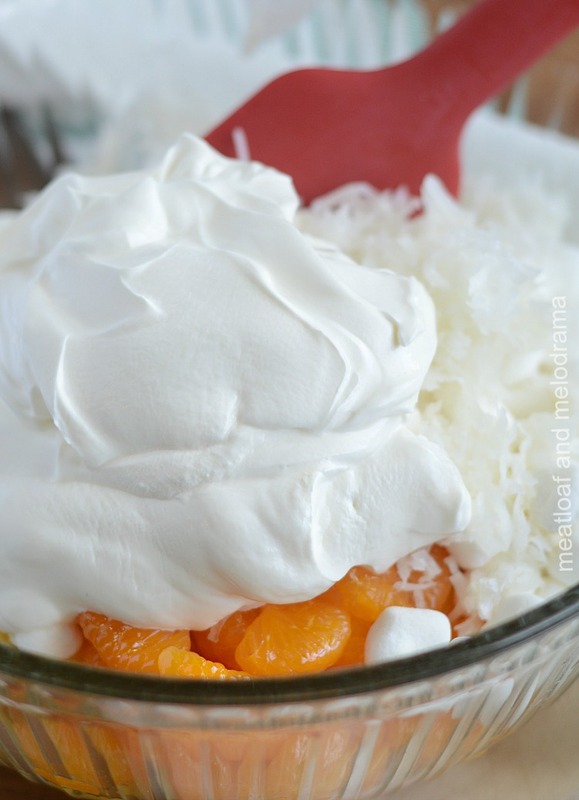 Easy Ambrosia Fruit Salad is a classic recipe with oranges, pineapple, marshmallows, sour cream and coconut that's perfect for holidays, potlucks and picnics! I hope you enjoy this easy ambrosia fruit salad as much as we do! This is such a nostalgic dish for me! Reminds me of summer at my grandparents lake house. My grandma would always make it for the kids. Brings me back with every bite! 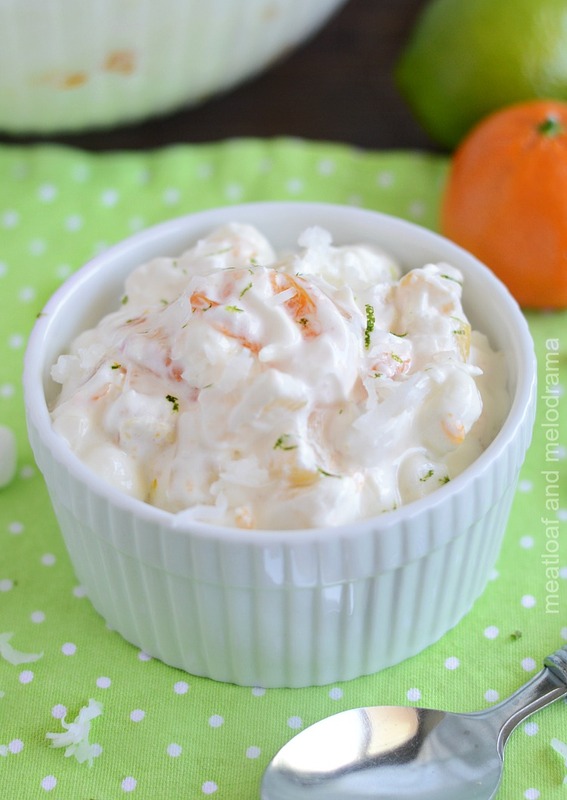 Such a great go-to dish for any potluck or BBQ! There are never any leftovers! YUM! Looks so light and perfect for Summer. Love the addition of coconut! This takes me back to my grandmother’s house! I hadn’t thought about this salad in a long time. Adding this to my to do list! Anything with fruit, I am in! This fruit salad looks so delicious! My family will love it! Thanks, Anna. My family loved it! 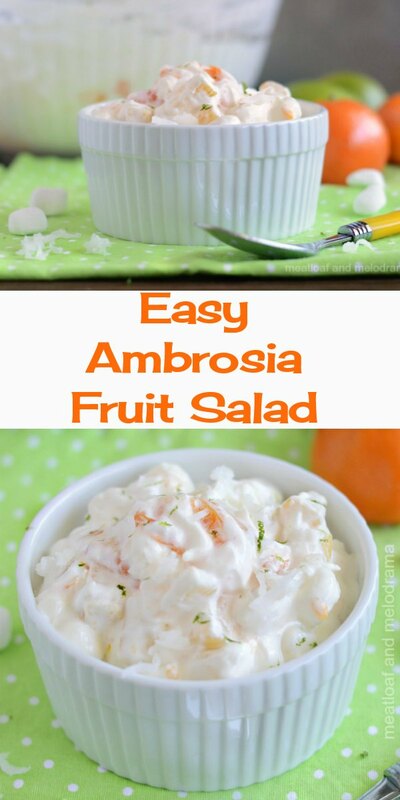 I love a simple Ambrosia, this looks so good!! Thanks so much for sharing your awesome post with us at Full Plate Thursday and hope to see you again real soon!